We revisited the glorious Abbey of Sherborne this month to give our Russian Treasures programme another outing. A packed Abbey gave us such a fabulous reception: it’s a magical place and the concerts there by candle light always create a wonderful atmosphere. We also went back to Douai Abbey, another stunning venue and another sell-out audience, for the Newbury Spring Festival. This time it was our programme of both early music, including Allegri’s ‘Miserere mei, Deus’, and works by the late Sir John Tavener which lend themselves so well to the choir splitting into different groups and moving around the audience. The Allegri high soprano solo was sung for us yet again by Emilia Morton. A ravishing sound that seems so effortless even though stratospherically high! Amusingly, when the solo quartet walked to the distant east end of the abbey to sing their verses we realised someone from the Abbey had left a microphone on which the quartet gathered round. 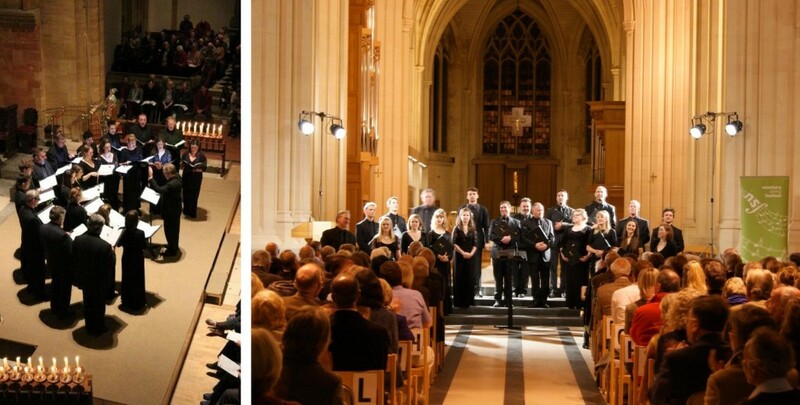 Instead of being hauntingly distant the audience heard every intake of breath and note they sang blasted through the abbey PA system, especially the poor alto, who happened to be about 1 metre away from the mic. Young Ruairi Bowen was quietly dispatched – I thought he was probably the fittest member of the back row and thus likely to reach them fastest – to get them to move to a different position! We arrived in the beautiful town of Speyer yesterday for a performance in the magnificent Dom: the largest Romanesque building in the world we are told. The cathedral is utterly vast but utterly beautiful with a fabulous 9 second echo to match! Hearing the choir sing the Byrd ‘Mass for Five Voices’ was a real treat, but in the second half they took my breath away singing the ‘Songs of Farewell’ by Parry. It was one of those concerts where no one spoke for a while afterwards as we all knew we’d just experienced something very special. The concert was broadcast live on the radio which gave an added intensity and having walked on and off stage three times the audience finally let us head back to the hotel where we are now enjoying some excellent German beer and from where I’m writing this blog. In fact we’ve just recorded a rather raucous version of Happy Birthday on my mobile phone for my son Joshy whose birthday is tomorrow! We are looking forward to travelling through the wonderful English countryside to make our way to Swaledale where the Consort – just 8 singers – will sing a programme of some of the most glorious music of the English Renaissance period, including Byrd ‘Mass for Four Voices’, ‘Vox patris’ by Mundy and ‘Exaudiat Te Dominus’ by White. I’m also looking forward to hearing the choir get their teeth into the Russian repertoire again soon for concerts in Reading and Stour.